Since the Readymade of Marcel Duchamp, "objets trouvés" are an important issue in modern and contemporary art. But what about the things lost? This exhibition tells us, in a few extraordinary examples, about loosing and finding. The objet trouvé, the found object separated from its context, is an important topic in modern and contemporary art. The experience that objects in an unusual combination or with provocative commentary can make an intellectual or ironic point led the Surrealists to unleash a flood of object montages whose fetishistic, magical, and often erotically charged content was informed by these artists' continued interest in psychoanalysis and psychopathology. With the introduction of the ready-made object by Marcel Duchamp, the idea of objet trouvé became significantly more radical. The disassociation from utility transformed ordinary objects into conceptual constructs. At the same time, with the inception of readymades, the ambivalence of setting values moved plainly into art's field of reflection. Initially conceived as no more than a protest against meaning - against the unquestioned superiority and preciousness of art - readymades opened up the possibility of a new artistic definition of meaning for meaningless objects. In the sixties, object art underwent a multilayered expansion as an interpretation of the reality of modern civilization in Nouveau Réalisme and Pop Art. The artistic reality of the image was to be reconnected to the reality of life, an endeavor that could be most concretely accomplished by using parts of the real world in art just as they were found. The objet trouvé became a quotation of reality; life was to be breathed into art with new techniques and unusual materials. Many innovative forms of presentation arose: accumulation, assemblage, combine painting, environments, installation art, and new forms such as happenings and Fluxus. It was an intensive use of actionistic and multimedia forms of expression that in modified form are still employed in contemporary art. A selection of works from various years is meant to demonstrate how artists use found objects today. Marcel Broodthaers created the work The Manuscript in 1974. It shows a wine bottle made of clear glass engraved with the words "The Manuscript" standing next to the box it came in. The words on the bottle and the title of the work refer to The Manuscript Found in a Bottle, a story by Edgar Allan Poe that the author published in 1833. With this object, which in fact only simulates a found object, Broodthaers connects fiction and reality in a complex interplay of references to time and content, a play of contradictions between signs and the things they describe. By presenting the definition of a subject from everyday reality in literal terms, the artist transforms it in an ironic distance of alienation, making a reference to the broken relationship between perception, definition, and meaning. The same buoyancy that is always retained in Broodthaers's process of reflection is found in the works of the artist George Brecht. Games and Puzzles shows a box containing an assortment of different balls like rubber balls, billiard balls, and Ping-Pong balls. This work is part of a series of Fluxus boxes developed by George Maciunas and Robert Watts that were to be produced in unlimited editions. They included concepts, events, and games by various Fluxus artists; their content often consisted of found objects. The unbiased use of these works is viewed as the creative point of departure for a new beginning. The found objects assembled here are detached from their conventional use, liberated from the rules assigned to them, and are consequently made available for a new, freely invented game. If playing pieces are lost, they can be replaced with other found objects. The American artist Alison Knowles became famous with her performance activities in particular. The performance of Make Something in the Streets and Give It Away took place as early as 1962. It was a street piece in which objects designed by the artist were given to the audience and hence entered the circulation of objects. But found objects also play a central role in her works. "My art documents my search for an expressive connection with nature and the continuity of change. In order to express my ideas about impermanence and transformation, I use broken and discarded objects or objects that are not yet formedâ€¦ what fascinates me about objects is their gesture and their sound," says the artist of her approach. Dark Triptych, from 2001, also consists of found objects. A found object, in this case an old doormat, also plays a central role in a work by Serge Spitzer, an artist living in New York. This badly worn carpet appears to have been thoughtlessly thrown onto the massive iron girder that is mounted to the wall above eye level. Through the elevation, this object, useless as it has become for everyday use, acquires a new significance and gains an independent life as an aesthetic object. As a real thing or real document, it is an indication of the events it has experienced in its existence and ferries us back to these events. It indicates situations that no longer exist, although not in the sense of a representation, but as a remainder or a trace. At the same time, this object occupies a new space, secures a new place, and - above all through its puristic presentation - imbues it with a psychological charge. Romuald Hazoumé is an artist from Benin who also works with found objects. His wonderful masks, like the one shown here from 2000, are made of discarded material that he finds around the corner as it were. The assemblages, constructed out of a latch from a washing machine, an oilcan, or a vacuum cleaner, are both examinations of modern civilization and society as well as a criticism of the sellout of his culture. "I give everything back to the people in the Western world that belongs to them - the garbage of a consumer society," says the artist of his work. But at the same time, these material collages also refer to the symbolic richness of ritual acts in traditional African culture. The fact that some things are hard to find is the subject of a 1990 statement by the Danish artist Henning Christiansen titled Freedom Is Around the Corner. Freedom always seems to be wherever we are not, and it requires effort to acquire it. You have to follow it, look for it, stay in motion, in action. And even though it's so close, reaching it may always remain a utopia. This work is a cryptic play on the topic of finding and losing. The expression "Around the Corner" is ambiguous: it can either mean that something is within reach or that something was just irretrievably lost. But what about things that have been lost? At first sight, it appears paradoxical, if not impossible, to want to depict something that no longer exists. It seems that the only things that can be depicted are the emotions that accompany loss - mourning, anger, regret, emptiness - or the consequences of loss that are best expressed on a verbal level or in music, such as in Beethoven's piece Rage over a Lost Penny. 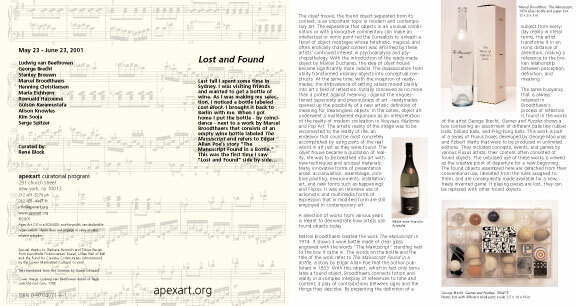 Lost objects also find their way into the fine arts. The concept art of the sixties did without the material objectification in art and instead relied on concepts and idea projections to inspire the creative thought processes of the viewer. Several other works have been selected here to demonstrate which expressions contemporary artists have found when dealing with the phenomenon of the lost. This Way Brouwn, by the Dutch artist Stanley Brouwn, dates from 1964 and explores the loss of orientation, the loss of a path, a direction, and the concomitant loss of security. For several years, Brouwn would stop passersby in the various cities he traveled through, put paper and pen in their hand and ask them to make a sketch. Losing the way thus becomes synonymous with a reorientation, but it is dependent on the passerby's willingness to participate. The drawings, affixed with the artist's stamp, are manifestations of the lost. But at the same time, they make authorship and originality a subject of the art. Gülsün Karamustafa, an artist living in Istanbul, repeatedly addresses the loss of a home, emigration, and what she refers to as "international nomadism." Her work is marked by the migration movements in her homeland, whether the massive exodus from the country to the cities or the emigration of Turkish workers to Germany, a topic referred to in the German title of her 1994 work Heimat ist, wo man isst (Home is where you are fed). The title is a wordplay on two verbs that cannot be translated into any other language. Three spoons seem to imply a family. Three is a basic unit, not a large family, but a small, vulnerable family. The three spoons, delicately connected with each other with a white cloth ribbon, become a symbol for the thousands of refugees who lose their homeland and are forced to find a new one. The contribution of the New York-based Korean artist Kim Sooja, Sewing into Walking, from 1997, also has to do with nomadism. The video was made in Istanbul on Istiklal Caddesi, one of the main roads in the city, and shows an endless coming and going of passersby. The film is accompanied by a soundtrack of Tibetan Buddhist chants. In Korea, "to make a bundle" means the same thing as "to leave a place" or "travel on," and in fact the artist did travel 2,727 kilometers with her Bottaris for the performance for Cities on the Move in 1997. In some projects, such as the video shown here, this topic is connected with the moment of "going," since clothes as such are connected with the process of going places. As worn objects, they most clearly refer to lived life, to home and protection, and to their loss. Before the opening of the exhibition, the German artist Maria Eichhorn from Berlin arranged to lose a silver ring that had been specially made for her in New York. The information in the exhibition tells the story of this seemingly irretrievable loss. But the loss itself points to the presence of the object, because it opens up room for many associations as to where it might be and what is happening with it right now. Who knows, maybe the ring will be found again and reenter the circulation of art as an objet trouvé. And so Maria Eichhorn will not react in anger over the loss as Ludwig van Beethoven is reputed to have done when he lost a penny two hundred years ago. The piano piece that arose out of this loss has become so popular that it has since generated millions of pennies in royalties.